The Chicken Run is the next most expensive thing you will buy, next to chicken houses and is most likely to be the weakest link as far as predators like foxes are concerned. How many chickens will I have? Always assume a couple more because it is a very addictive hobby and you will soon be tempted to add a couple more hens to your flock! What space do they need? There are guidlines but legally a battery hen has enough space…. so perhaps you should consider what a fair size run would be for them to move around in, scratch, dust bath, feed and drink and whether there is enough room for them to get away from another hen if pecked. So lets look at the options, you can pay for a chicken run that will cost you money or you can build a chicken run that will cost you in time but is less money! 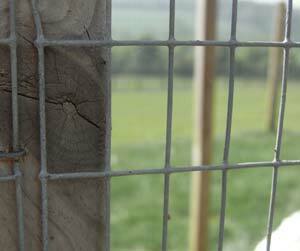 Small chicken runs can protect birds and you can let them out when it’s safe. Most of the chicken runs that you can buy to fit onto a coop (or that are built into a coop) are rather small in my opinion. There is an answer to this though. 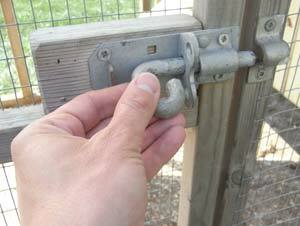 Use this run for your girls when the weather is really bad or when there is a higher risk of predators but at other times, open the door and let them out! The down side to this is that they will spoil a small garden over time with their scratching and dust baths, will eat some of your plants and will leave droppings on paths for you to step in! The good news is they get to free range and will be far happier and healthier hens, you can enjoy having them out and can limit their time out a little to allow the garden to recover. You can of course fence chickens into a certain area of the garden which can help if you have plants that you don’t want destroying. An alternative to letting them out of their run is to use a portable run so you can move them around onto fresh grass at regular intervals. I have done this regularly with my young growers but be warned they soon spoil the ground and need moving every few days if the grass is going to have a chance to recover so make sure you get a house and run that’s easy to move on your own or with someone. When buying a run, you will need to look at the quality of the wire – small rectangular or square mesh wire is better because foxes can’t get their teeth in to tear at it. Cheap rabbit wire can be quite thin (especially the cheaper, imported versions from Asia) and I have seen this torn open in weak spots, sadly enough for Mr. Fox to get through. If you decide to use rabbit wire then look for British made, galvanised wire. You certainly ‘get what you pay for’ here but it’s worth doing the job properly. Latches or bolts to doors are important as well. Galvanised fittings will last years so it is worth paying for these. Screws need to be stainless steel so they don’t rust. Foxes will dig under a chicken run. If you have problems with foxes during the daytime (or your chickens are not securely locked up in their house at night) then you will need to consider putting your run onto bricks so that Mr. Fox can’t dig underneath. You can put wood chips down inside the run so they can be changed regularly. There are some smaller runs available on this website here that might be customisable to your coop. They also use reasonable mesh wire which you often don’t find on runs this cheap. 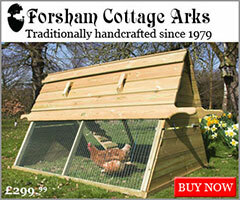 If you are going to build a chicken run, you will need to spend less money but more time. You can of course build a small portable run, much like you would buy and the same things apply to this as I’ve mentioned above but often, people that are building a run go for a fixed run in the corner of the garden. Rabbit wire is the most economical choice but do be careful with the quality of it. If it isn’t particularly thick, a determined fox will be able to tear at it to get in. a double layer around the lower half of the fence is best if the wire quality is poor. Ensure that weak points such as where wire joins houses is securely stapled. These areas will need checking regularly for signs of wear and tear. If installed correctly, electric fences are very good at keeping foxes out but on occasions, I’ve seen a run with a fox unable to get out! Sadly the damage has already been done. Electric fences are not always suitable for every back garden but even in an urban environment where there are people, you can use an electric wire around the top of a fence to stop foxes climbing over. Chicken wire needs to be burried at least 6 inches with another couple of inches turned outwards but if the soil is loose, you may need to go down 9 inches or more. A fox can run up a fence (don’t think of a fox being like a dog, they can move more like a cat and can jump and climb really-well) so unless your run has a wire roof, you will need to make the fence at least 6ft high and ideally sloping outwards at the top. Gates should ideally be made from a solid mesh stapled to a sturdy frame. If this is not possible, at least make sure the gate cannot twist, allowing a predator to get through if pushed in the corners. A fox will easily get through a small hole. If you don’t believe me, go to my page on foxes and watch the film of the fox squeezing under the fence that’s just a few inches off the ground! Another method of building a large chicken run is to build some ‘chicken run panels’. You can cut all of your wood in one go, with many pieces being the same size. Once you have produced enough panels, you can screw them together making a large run that’s easy to assemble. Keep the panels off the ground so they don’t rot, a brick base on a small strip foundation is perfect but I’ve seen people use rectangular posts on their side and (better) old railway sleepers buried in the ground. Building a chicken run is really straight forward if you have some basic DIY skills and follow some of the guidance I have given above. 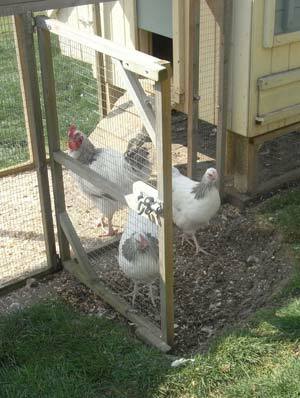 There are a number of chicken run designs that manufacturers use and a few other ‘home made’ runs that are successful. 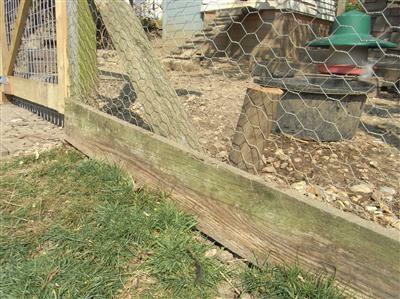 It is difficult to say when a chicken run becomes a ‘fenced off area’ (see my page on fencing chickens if you have a large area to fence off as a run). I tend to call both ‘the chicken run’. Here, I am going to call the ‘chicken run’ an enclosure that could be 3 to 4 meters long, usually attached to the coop, rather than being ‘around’ the coop and is often covered over. Start by drawing up the run how you see it in your mind. I like to make notes on my drawing as things pop into my head. This can save you significant time later on if you have thought it through before buying and cutting wood. 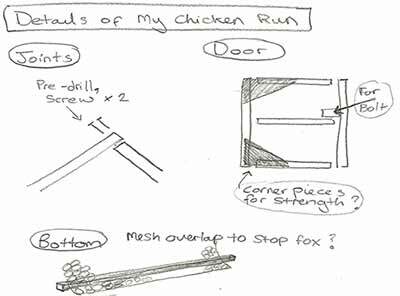 Draw a ‘close up’ of how you are going to make the joints of the chicken run, doors, joint wire and so on. 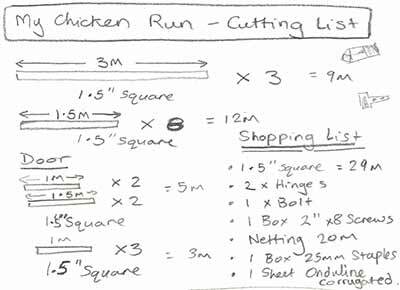 Build a ‘cutting list’ of pieces you will need to build the chicken run. Turn this into a ‘shopping list’ by working out how long your wood needs to be and what sort of thickness you will need. 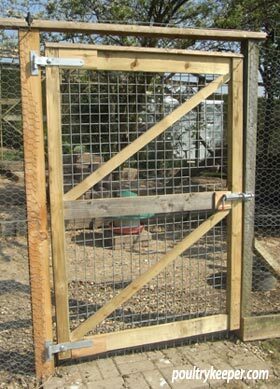 Add hinges, latches, screws, nails, poultry netting and staples to this. Go and buy your materials, allowing a small amount extra for mistakes! One of the best sources of information on chicken runs has been looking through old poultry text books from the 1900’s onwards. These often give chicken house and run plans that have stood the test of time. 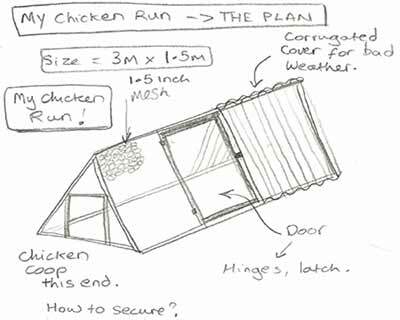 Many have fold out pages with the plans on so providing you are happy to work in inches and feet, for a couple of searches on eBay and a few pounds, you can soon have quite a few chicken run plans. 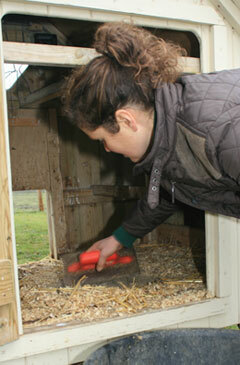 Sand is a good substrate because hens can scratch and dust bath, two very natural behaviors. It will need changing once it’s messy but should help with the smell. We got 8 baby chicks about 2 months ago and have (very slowly) been building the coop and run. For the past few weeks we’ve been letting them roam the whole yard during the day, and then they put themselves away in the coop at night. The Run we’re building is about 8x3x4 ft high plus 4x3x2 ft high under the coop. Our goal is to have them spend most of their time in the run so they don’t totally demolish our garden/poop on everything, with more occasional trips out to the yard. What do you think the odds are that they throw a fit when confined to this smaller space now that they’ve gotten used to the whole yard? Did we screw the pooch on that? Also, we lined the bottom of the coop with more of the square fencing wire to avoid having to dig down, were thinking to put down a layer of something on top of it– dirt? sand? wood shavings? some combination thereof? Recommendations appreciated. Yes, they will probably try to get out for a while if they have been used to the larger area. Hard wood chips are good for runs. They drain well and wash through quite well and can be changed (maybe yearly) when they become messy. Do not use the cheaper bark clippings because these can harbour mould spores that can be harmful. We are thinking about renting part of a field to keep some chickens, if I bought a run and then added another layer of chicken wire mesh over the top would that be sufficient? Without looking at it, it’s difficult for me to say yes for sure. It sounds like it would be secure. 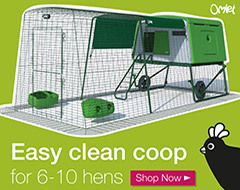 Hi, what do you think of the Eglu walk in runs please? 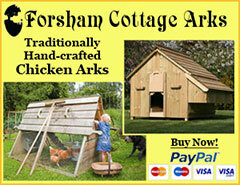 We have a small one here – it has worked well for us for a small number of chickens. We normally let them out of the run when we’re around. Would you recommend a run regardless? We are thinking of getting some chickens. We live in a cottage with a small garden and have a peacock that has taken up residence and have rather taken with him! We have a lot of pheasants as well. I’ve never seen a fox around, though it doesn’t mean there aren’t any I guess. Anyway, opposite us is a huge field with 2 horses, and the person who owns them (and rents the field) is one of our neighbours and they said we can put the chickens in with the horses (assuming the landlord is OK, which they will be). So, they would effectively have a huge run. I like the idea of the automatic door closer (assuming the chickens do go in before it shuts, the peacock is always roosting before dark so I guess they do). Noobs question, but can chickens fly? We’ve quite happily let them come into our garden and into the house if they want to, but they’d have to get out of the field. Thanks for your site, loving having a read thought it. 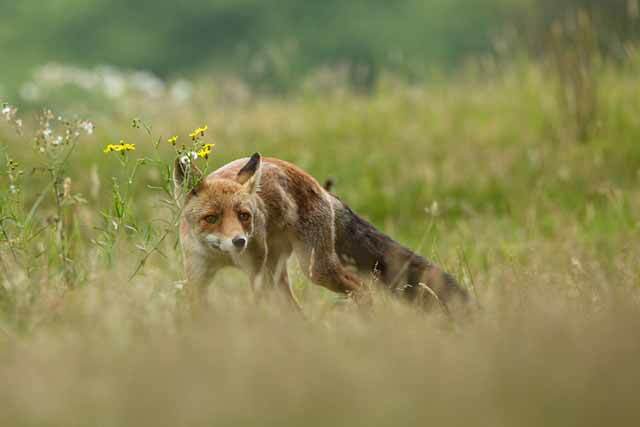 Unless you live on the Isle of Man then yep, foxes are about… so even if there are no problems now, you need to think along the lines of protecting them longer term. Having them locked up at dark is #1 priority, so the automatic door closer for the chicken house is really important unless you will always be able to do this. Second to this, I would try to have a run / area where you can keep them in if there’s a problem – somewhere they come back to for food and can be locked in if needed. Then yes, try having them free range across the field – the risk is worth it to give them free range. Something you can do if you have fox problems is use an electric fence – the horses are probably used to this anyway. You could put 3 strands of electric on plastic insulator posts around the field. The fox will learn he can’t cross this and won’t jump over once he has (they usually test / touch a fence before jumping over so get a shock and learn it’s not safe). Good luck and do come back to let us know how you get on? 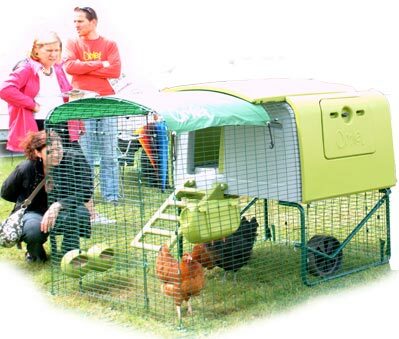 I’ve been wondering if it would be feasible for us to keep chickens. We have a raised platform we may be able to convert but as I’m in a residential area, need to keep noise and smell to a minimum. I have a garden but with a small child with guineas I’d be looking at picking grass to give as a supplement as opposed to leaving them to free range and poo everywhere. The space is 137 by 240. Can I do this? How many chickens can be happily kept? What’s best floor cover to be non smellyish, practical and the best non mite attracting house setup for this size would be…? The eco ones look good but I don’t want a mega mite infestation sounds like bad news indeed. Need to keep as practical as possible. Foxes are abundant and cats. Please do let me know if I’m being wildly impractical. Chickens in a small space is always a challenge! If that’s 137 x 240cm then it’s a push. If you go for it, I would try to get a small house that can have a run underneath it as well so that you make as much run space as possible. Chickens are flock animals so 2-3 would be the minimum number to get. BUT you’ll need to import a lot of greens and keep them clean, at least weekly and try to hang some their green food to get them jumping for it to keep fit and stop getting bored. For the floor, I recommend a few inches of hardwood chippings, deep enough for them to scratch and dust bath (not bark, it rots and causes problems). They should be washed over when mucky and then completely changed from time to time, probably every year. The run of course needs to be sturdy enough to keep the fox out. Hi I have a small field I was going to let the chickens go free range but with an automatic door on the coop to open and close at night, do you think this will be safe? We haven’t seen any foxes for a few years now? Yes if there are no foxes, but you might be surprised and find a fox turning up once there are chickens around so I would be careful.